About 15 years ago I got really interested in Wicca. I was living in London and watching the seasons swing by. It was pretty fascinating to visit some pagan sites and become a bit in tune with nature. It made SENSE to me in a way that Christianity never has. Of course this crazy new concept called the internet was in its infancy, so I did heaps of my research in BOOKS, with helpful chapters like “How to find a coven” and “Why were witches persecuted?”. Needless to say I never did find a coven and coming back to Australia, with the opposing seasons, it all got a bit confusing and topsy turvy. Northern Hemisphere paganism definitely fits more nicely into the calendar year. In June, when sunk in the depths of winter depression, I always think how nice an upcoming Christmas (or ‘yule’ if you’re a witch) celebration would be. I could really use something cheery, with presents and family and food. There’s not really any need for it here in December – such an overload of good times! For me, reaching the winter solstice is an annual milestone. I like to quietly note it. I’m thinking of including the kids in a little candle lighting ceremony this year. The tradition is to spend a minute or so in the dark, contemplating the darkest day of the year. Then light just one candle, to symbolise life being reborn (sorry, does that sound too witchy?). At the moment week 8 tiredness has combined with winter illness to transform my children into feral creatures, so it’ll be nice to force them into stillness. Although I strongly suspect my meaningful moment will be interspersed with Mr M&P doing a fart noise, then Miss F setting half the kitchen on fire. They’re just a bit crazy like that right now. But if we make it through, I’ll finish off with a simple dinner of celebration. You might want to too. Turkey, pork and traditional ‘Christmas’ foods are good. 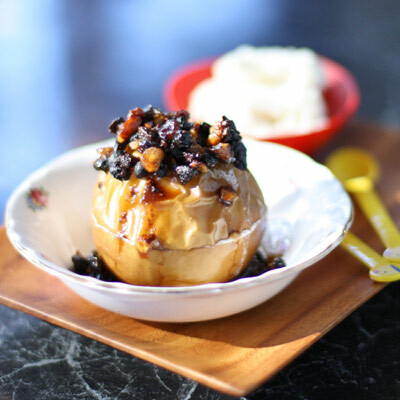 And finish with a dessert that pays tribute to the simple seasonality of life, like these baked apples. Symbolic, easy and most importantly, delicious. Core the apple. Slice around the circumference to avoid it bursting during cooking. Place it in a baking tray (I use a loaf tin lined with baking paper). Mix all of the other ingredients together and fill up the empty centres. Drizzle some water (about a 1/4 cup should do) in the tray to help them cook. Bake for 35-40 minutes until soft. Serve with icecream. PS My husband is constantly telling me that if I want my biz & blog to be more successful, then I need to self promote more. He says I need photos of myself everywhere. But I HATE having my photo taken. 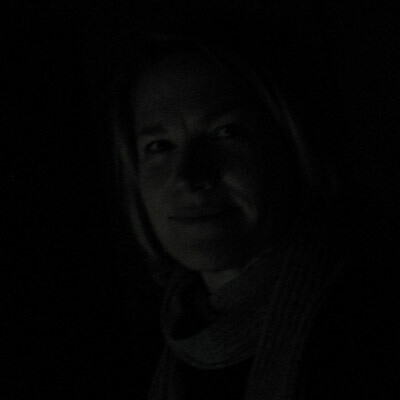 So I’m compromising with my Winter-solstice, self-portrait. Self portrait (before I light the candle). How exciting – I haven’t seen it yet, will grab a copy. It is a really great, practical mag, so I’m really happy to be associated with it. Nothing like a simple baked apple, reminds me of winter desserts as a kid. As for the pagan stuff, I studied witchcraft at uni for a while (under the guise of anthropology), it’s amazing how prevalent pagan-type beliefs are worldwide and how much sense they make. Did I mention I possibly have the most uselessly impractical degree of all time! But boy did I have fun tormenting my parents with all the whacky subjects I selected. In the end though they had the last laugh when I realised I was basically unemployable and ended up back at uni following my dad into teaching. Your site is fantastic, with or without photos of yourself! I’m constantly visiting your site looking for new ideas! Thank you! I’m yet to buy your books but will soon, keep up the good work!